If you are unfamiliar with Skype, it is very simple to install and use and is a free program. If you would rather do the Qigong distant healing session by phone instead of Skype, that would work as well. Just let Master Lisa know your preference. ~To learn more about Skype click here. A Qigong distant healing session proceeds with a similar format as seeing Master Lisa in person. After registering for the session, you will receive a Traditional Chinese Medicine (TCM) questionnaire to fill out and email back. You will also receive the Skype contact info for Master Lisa so that you can add her to your contacts list. At the time of the scheduled appointment, Master Lisa will place a video call to you to begin the healing session. There will be a discussion of your health and your goals for the healing session and then you will be asked to lie down in a comfortable position where you can be seen by the webcam on your computer. If your computer does not already have a webcam these can be purchased for a small fee at any office supply store or department store (like Bestbuy, Target, Walmart). Once you are lying comfortably, the healing will begin. Master Lisa will scan for energy blockages, clear them out of your body, and send healing energy into your body utilizing meridian points specific for your particular health issues. Many people find this experience so relaxing and comfortable that they fall asleep. Some people feel the energy flow easily and can experience sensations such as feeling warmth, tingling, vibration, floating sensations, and deep relaxation. The webcam will allow you to speak to Master Lisa at any time during the healing if you have comments or questions that arise. Once the healing is completed, Master Lisa will let you know. After the healing is done, there will be a discussion of what was experienced by you and by Master Lisa and you will receive instruction on Qigong techniques that would be helpful for you to practice or nutritional changes that would benefit you. Master Lisa will send you an email afterwards that includes the directions for the techniques she has taught you so that you will be able to practice on your own. 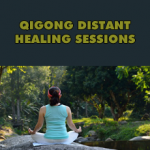 You will receive benefits with even just one Qigong distant healing session, though it is recommended that you have follow up healing sessions if you have chronic health issues that you are working on. Many people feel some improvement beginning within just a week or two after the session if they are diligent about practicing the techniques taught to them. For most people, three healing sessions is a good idea to create lasting change. Each healing session you receive the benefits of having Master Lisa remove blockages and improve energy flow within your body as well as learn more techniques for helping yourself. By the third session you will have a pretty good routine for self care to practice on your own. The goal of Qigong healing is to give you a jump start on your healing journey and teach you what you need to do to help yourself! Qigong distant healing has a very long history of improving health physically, mentally, and emotionally. With the recent advent of video conferencing programs like Skype, this process has greatly evolved. Prices as low as $85 per session.